Jurassic Park was one of my first games when I picked up a Super NES. I don’t remember if knew much about the game ahead of time, but I was quickly drawn in by the premise of mixing third-person exploration with first-person… more exploration. I certainly found this more interesting than the side-scrolling affair on the Genesis, and it turned out to be a pretty neat introduction to what the SNES offered (the other game I bought was StarFox, so the purchase was quickly justified). However, there’s no save system, so I never beat it. Now, some 17 years later, I finally got around to getting off the island. This certainly won’t be a walk in the Par… ok, I’m leaving. 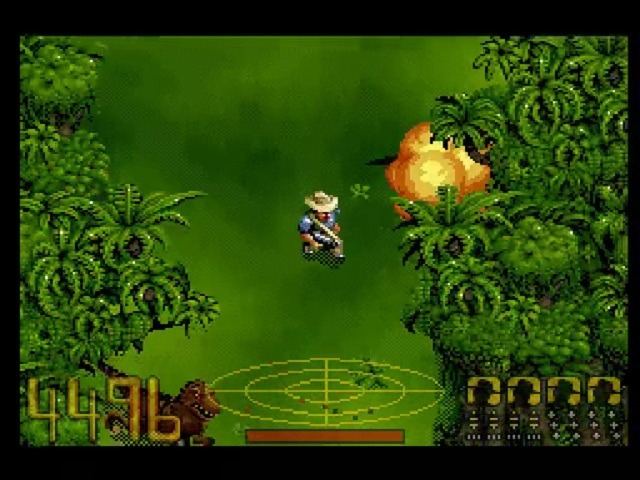 Jurassic Park’s setup is predictably familiar for JP-licensed game. You’re paleontologist-at-large Dr. Alan Grant, you’re stuck on the crippled dinosaur island, and you have to escape. Your laundry list of preparatory objectives is pretty extreme – restart the generator, reboot the computers, seal off the Visitor’s Center, stop a ship from leaving with a cargo of dino stowaways, gas the Velociraptor nest, contact the mainland for pickup, collect 17 eggs, get to the helipad, and get home in time for Corn Flakes. To accomplish all this, you’re going to have to find a whole host of access cards to open up sealed areas, as well as work the park’s computers to activate systems and gain higher security clearance. And you can’t save. It’s going to be a busy day. Travel takes place in an overworld section, where Grant lopes around in an isometric perspective. The island is divided into three major paddocks with the Visitor’s Center in the middle. Only one paddock gate can be unlocked at a time – and only by using those computers you have to reboot first – so there’s plenty of backtracking and planning to be done. The overworld features jungle areas and multi-level mountains, both which serve to break up the map and hide eggs within some maze-like nooks. Dotted around the overworld are buildings. Each acts like a self-contained dungeon, and each holds ID cards and leathery dangers inside. These interior sections are handled in a first-person interface. You see the hallways through Grant’s goggles, and steer him through doors and elevators in search of your next objective. Trying to open a locked door will display the ID card needed to open it. If you don’t have it, you’ll need to mark the door in your notes and return when you do. Dinos stalk inside too, so you’ll need to be careful when entering a room and stock up on plenty of ammo. Certain areas also require nightvision goggles, and if you try to enter without having first collected the battery, you’re instantly eaten by a grue. Dive into buildings to search for keycards and computers. 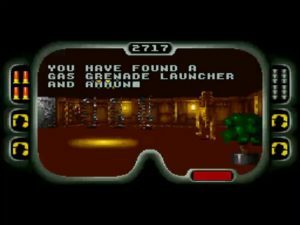 Along the way, you’ll also encounter green computer panels that shift you to an interface manipulated with Grant’s floating hand. You’ll click on icons to open that park’s subsystem, and then can interact with that system to a limited degree (such as using the radio, or opening gates in the overworld). Major actions can only be performed at the one terminal with clearance to do so, so again, you’ll be marking that terminal in your notes and coming back to it later. Again, not being able to save is the game’s biggest frustration. You could probably speed-run through the game in a couple hours or less once you know what you’re doing, so it’s definitely one of those games where most of your time is spent in trial-and-error and note-taking, slowly building out an order of moves that will result in victory. There are no in-game maps either. I remember being confounded by many areas (like the Raptor pen) in my youth, but playing today, every area is actually fairly small. There’s not a lot of ground to cover in the overworld, and no one floor of a building gets overly large or complex. You might need to draw your own maps, especially to track those hidden eggs, but I was able to complete the game without. Those two issues out of the way, the game itself is actually pretty easy. To be clear, dinos are plenty menacing in the overworld. Raptors emerge from bushes – sometimes in packs – to leap upon the unsuspecting Doctor. You can aim in eight directions, but dinos can move in far more, so it’s easy to miss when you’re ambushed. Dino claws also do quite a lot of damage in a short amount of time, while health pickups are exceedingly rare. Worse, the Triceratops and T-Rex will sprint at you for an instant kill if they catch up. Both only appear in specific “corridors” of jungle (Triceratops runs vertically, the Rex charges horizontally), forcing you to dive into a side pit and let them pass, or drive them back with tranquilizer darts (no other weapon has any effect). Don’t worry, he’s just going to walk back and forth endlessly and never even notice you. Making up for all this is the leisurely pace of the indoor areas. Your view is choppy and your movement slow, so to compensate, indoor dinosaurs are brain-dead. They will only activate when you’re about five steps away, meaning you will frequently occupy the same room while they just stare blankly and wait for you to line up a shot. Furthermore, any indoor dinos you kill are gone for the rest of the game (which may explain why there’s no save system), but any and all pickups will respawn each time you re-enter the level. 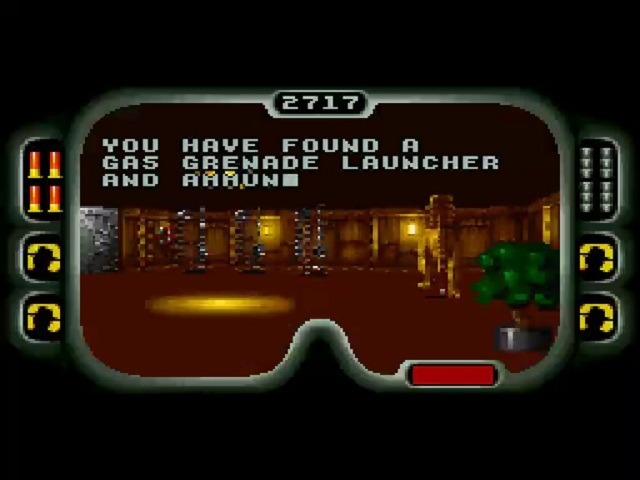 It’s incredibly easy to pull a Metal Gear and stock up on more ammunition than the displays can track, or to pop by a building whenever you need some health (e.g. : the Visitor’s Center always has a turkey leg waiting right in the lobby). 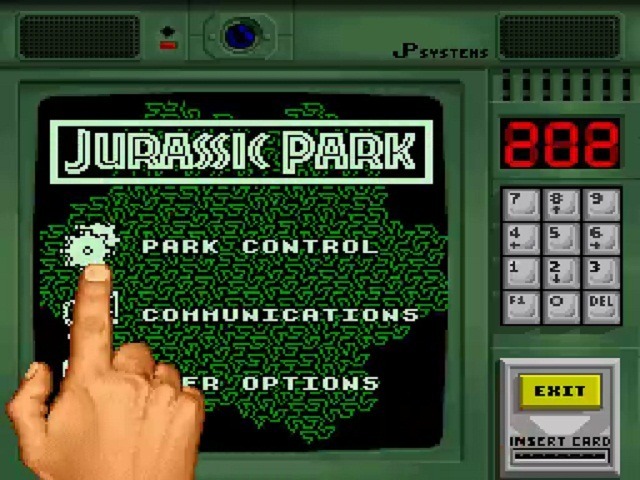 The entire game’s pretty generous with the 1-ups too, and once you activate the park’s motion sensors, you’ll see all pickups and dino ambushes marked in the overworld. This just leaves you with handling the tedious business of finding all the hidden cards, correct terminals, and dino eggs, though I personally didn’t find the objectives that much of a chore. Your tasks are at least varied, and they do keep things interesting. There was certainly enough going on to keep me intrigued and wanting to finish the game. Graphics in the overworld areas are bright and colorful, with some dithering if you look closely. Dinos are drawn in a mostly cartoon style, but each looks recognizable and distinct. Controls are also precise here, and you’ll have no trouble getting around or spotting the viable paths. The first-person sections have a pretty impressive amount of detail in their wall textures, and you will see a decent amount of variety in the locations (the utility sheds use completely different art than the Visitor’s Center, for example). The engine does crawl along though, and there’s no getting around that. It’s about 4-8 frames per second, and noticeably worse than the Wolfenstein 3D port. 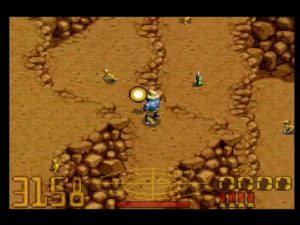 It does somewhat work with the cautious pace of these sections (this is exploration, not action shooter), and it is playable, but it’s far from ideal. Two of the paddocks have large mountains to climb. Watch for falling boulders! There’s also some neat little touches that deserve a nod. Characters offer warnings or advice as you travel the park. Nedry (the greedy saboteur from the film) appears in this cycle and gives you intentionally bum advice; like claiming poisonous spit will heal you, or your next objective is to shut off the park’s power. 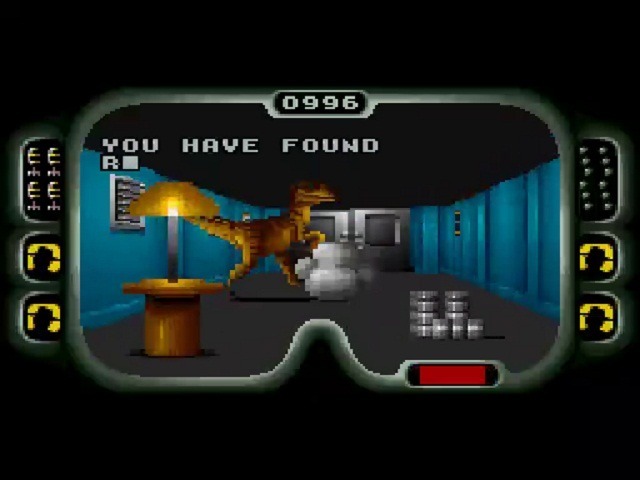 If you stand still or pause the game, Mr. DNA will appear and cycle through some various dinosaur trivia. And getting really nerdy, one of the computer options changes the pattern of the terminal’s background fractals. Fractals played a role in the JP novel as a visual representation of Malcolm’s Chaos Theory. Thumbs up for the subtle reference, Ocean (and they’re pretty too!). 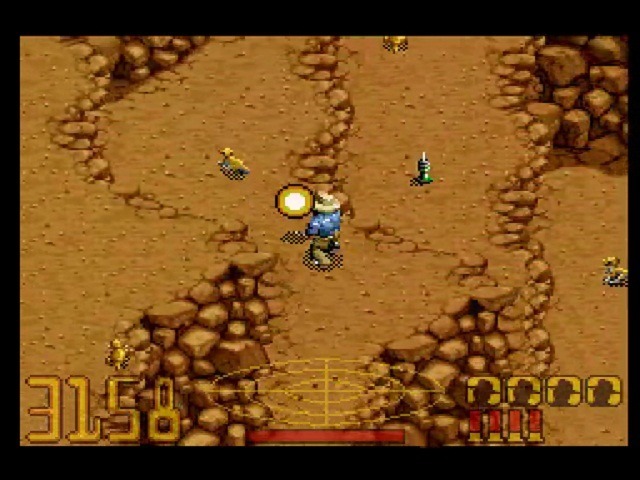 Ocean did a similar overhead/first-person mashup for their JP game on the Amiga, but I think the version here pulls the idea off better. Both as a kid and playing it today, I was engaged with completing the next task and exploring the park and its facilities. Your mileage will vary here, of course, and there’s certainly plenty that has the potential to frustrate – especially if you’re not that interested in “Metroidvania”-style games. Just be aware that the ending is a simple credits screen, so the journey is its own reward. If you’re not intrigued pretty quickly, you’ll do best to move on. Fun little adventure, if you like exploration. Different take on the license. Computer interfaces and first-person sections give some neat variety. Mouse support in the FPS sections is a nice touch. Choppy first person view. No saves, no maps, no way to even quickly check your inventory (you can only do this at a terminal). Backtracking and hidden eggs will surely frustrate more than a few.